Every week Instagram look back and select some of their favourite images from emerging voices across the globe. This week, I’m one of them!!! You can imagine my delight when I recently opened my inbox to find an email with the subject line ‘Hello from Instagram!’ informing me that I’d been selected to be an Instagram emerging voice of the week. You’ve heard the proverb “no news is good news” right? Well, in the world of photography, a personal email from the community team at Instagram (yes, THE Instagram) isn’t just good news, it’s truly amazing news! With over 300 million monthly active users and an average of 70 million photos shared on Instagram every single day, I’m surprised that my 15 second Hyperlapse video of a sandstorm sweeping through the sand dunes of St Annes was noticed by their team. The expression “a needle in a haystack” comes to mind. 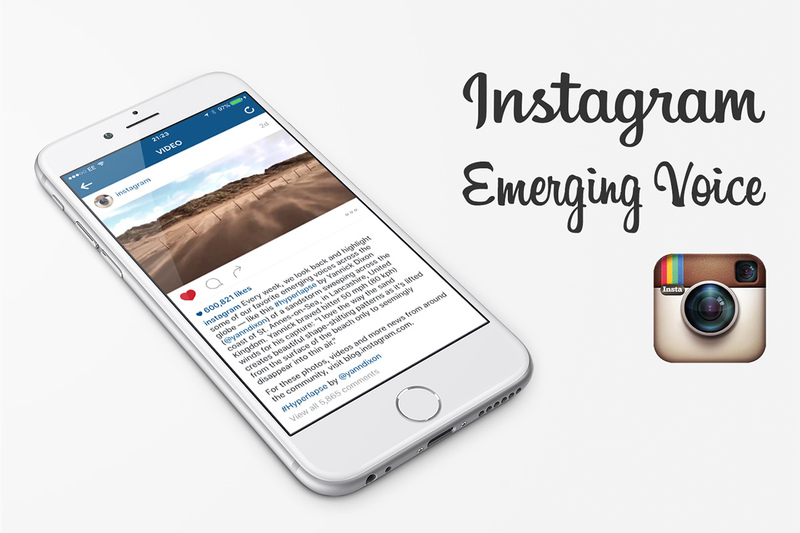 So, what is an Instagram emerging voice I hear you ask? Every week Instagram look back and highlight some of their favourite emerging voices across the globe. These “emerging voices” are featured on blog.instagram.com and shared to their 138 million followers. It’s an honour to be featured by Instagram and given the chance to reach a huge audience. The moment they shared my Hyperlapse sandstorm video and announced me as an Instagram emerging voice of the week, my iPhone went crazy with notifIcations of likes, kind comments and new followers. I’ve never had a response quite like it. As you can see, my video has received over 622,500 likes and more than 6,000 comments! It’s surreal to see and makes you realise how powerful and amazing Instagram actually is. I thought you’d like to know what Instagram asked in the email they sent me, so I’ve included their questions and my answers below. You never know, hopefully, you’ll be featured as an Instagram emerging voice one day too. Before you read the Q&A’s, be sure to follow me on Instagram. I’d love to see your photographs and connect with you there. Question 1. Can you confirm if this was made with the Hyperlapse app from Instagram or another tool? Yes, I made my sandstorm video using the wonderful Hyperlapse app from Instagram (with an iPhone 6). Question 2. How did you go about making this video? Due to the bitterly cold and ferocious 50mph winds, Instagram’s Hyperlapse app enabled me to capture the sandstorm handheld (even the most sturdy tripod would struggle to cope with these kinds of blustery conditions). Even though my hands were shivering and eyes watering from the immense wind & cold, the process of making the video was made easy thanks to Hyperlapse. I filmed the scene for a couple of minutes until I could barely feel my fingers. Afterwards, I rushed back to the relative warmth of my car beyond the dunes to edit the video and share with my fellow Instagrammers, before heading back to the beach to capture more photographs and video of the sandstorm. Question 3. What’s happening in this scene? Describe the moments before, after and during? This Hyperlapse captures a sandstorm sweeping across the sand dunes of St Annes-on-Sea on the Fylde coast. This meteorological phenomenon, where strong winds lift loose sand from the dry surface of the beach, reveals Nature’s incredible power to transform the landscape before our eyes. As a photographer who has lived by the coast for more than a decade, I knew there was a strong possibility of a sandstorm that morning. I couldn’t have dreamt for a more magical sight as I traversed the dunes to be greeted with a sensational sandstorm. The following two hours were spent photographing, filming and marvelling at the beautiful scene I found myself in. It’s an experience I’ll never forget. Question 4. Did you have any particular inspiration for this moment? Question 5. What do you like most about your video? I love the way the sand creates beautiful shape-shifting patterns as it’s lifted from the surface of the beach only to seemingly disappear into thin air. Question 6. Anything else you’d like to add? I’d just like to thank you for selecting my video to be featured in The Week on Instagram. I’m absolutely delighted and truly honoured to be featured. The Instagram community is a constant source of inspiration, encouragement and generosity that helps us all to grow as creatives – I’m so happy to be part of it! Remember how I asked you to follow me on Instagram? Have you done it yet?! If not, now is the perfect time to do so! Thank you so much for reading and, after hopefully following me on Instagram (okay, I know you get the hint by now), leave a comment below. I’d love to hear from you!